GPRSIM makes your GPR data interpretation easier by allowing you to simulate radargram data based on expected sub-surface conditions. GPRSIM is provided through annual licences only. The price above covers software usage and updates for one year only. Need an invoice so you can pay via bank transfer or cheque instead of using a credit card? Just add this to your cart and follow the instructions through to the check-out. You will be given the option of receiving an invoice at that point. After placing your order, check your email to receive the invoice. 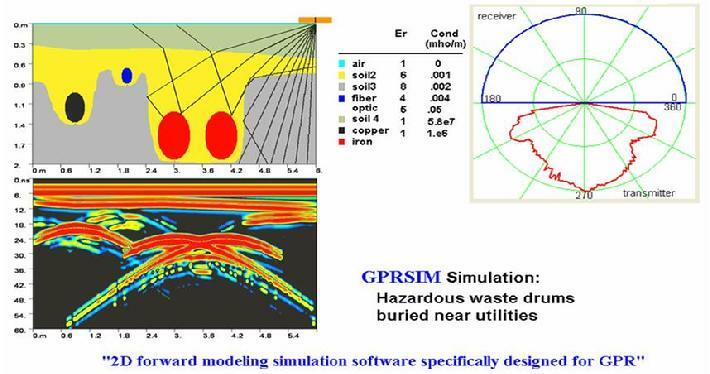 GPRSIM is a completely interactive 2D forward modelling software designed specifically for ground penetrating radar. 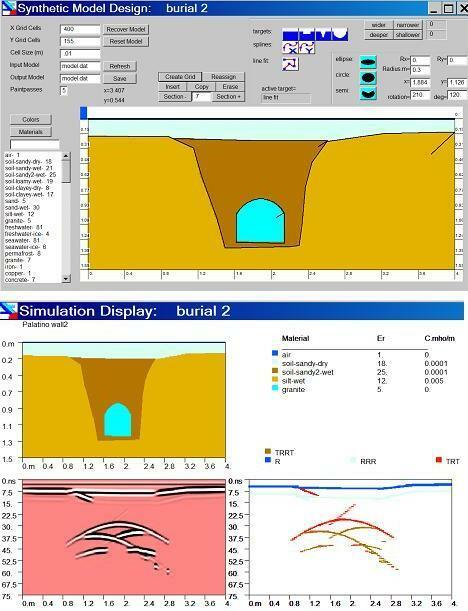 Use GPRSIM to draw a cross-section of what you’re expecting to find below-ground. Specify some antenna parameters (e.g. frequency, time-window, samples per trace/scan, antenna geometry, etc. ), soil and geological parameters (i.e. what sort of soil and rock is present, topography, etc. ), and GPRSIM will produce a simulated radargram based on your drawn cross-section. 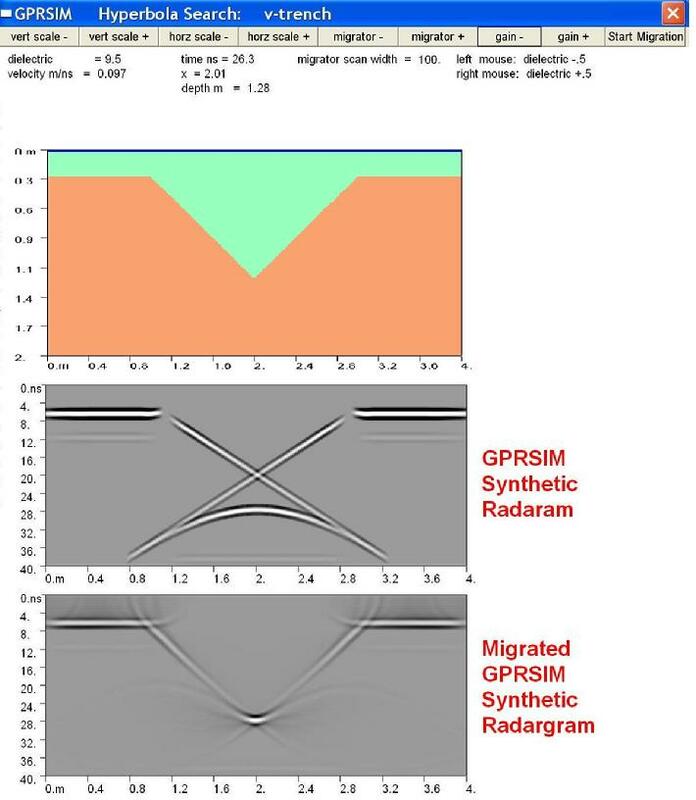 You can use GPRSIM in unusual scenarios where you’re not certain if ground-penetrating radar will be an appropriate tool, or if you’re not certain what a specific buried feature would look like in a radargram. 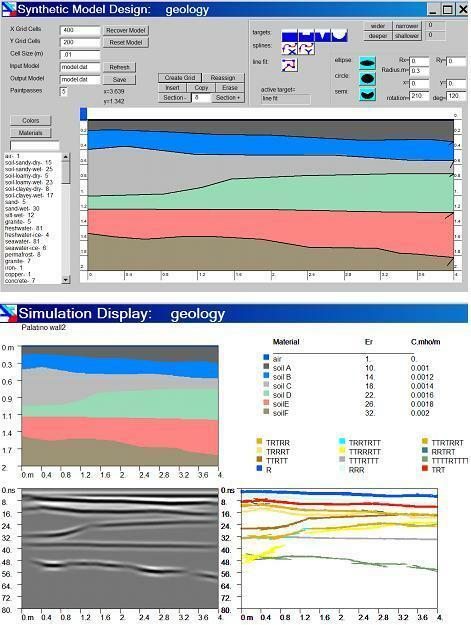 GPRSIM makes your GPR data interpretation easier. GPRSIM predicts the full waveform of microwaves that are reflected, transmitted, refracted and attenuated across model ground structures. You can also export simulated radargram files for processing in GPR-SLICE in order to e.g. export an entire simulated grid-based dataset in order to simulate depth-slices in GPR-SLICE. 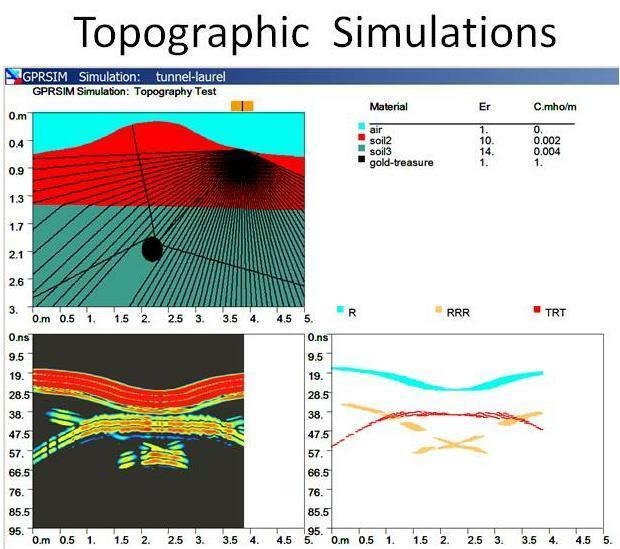 The complete theoretical details of GPRSIM are available in a paper by Dean Goodman, published in the journal “Geophysics”, vol 59-2, p224-232, 1994. 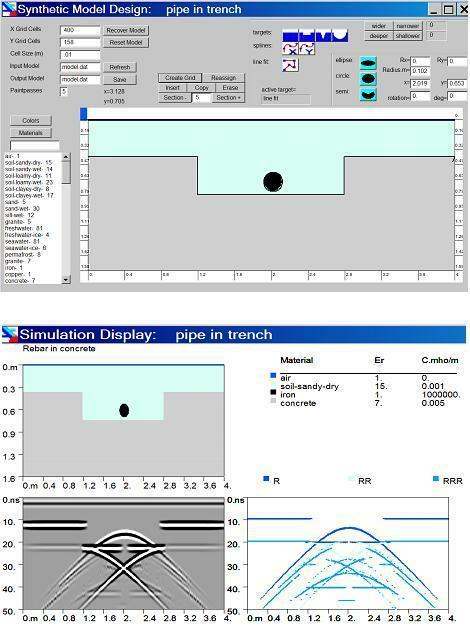 A simulation of a V-shaped trench, and a migrated simulation of the same dataset. 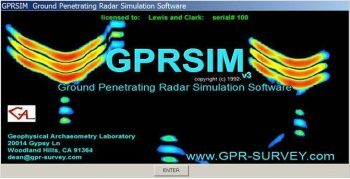 GPRSIM has a processing menu which allows the user to perform linear migration of synthetic radargrams. In the below example, a V-shaped trench – which causes complicated radargram patterns normally – is improved using migration processing to more accurately reflect reality. Note, that with perfect synthetic data, pseudo data is mapped into areas where previously no reflections are predicted. 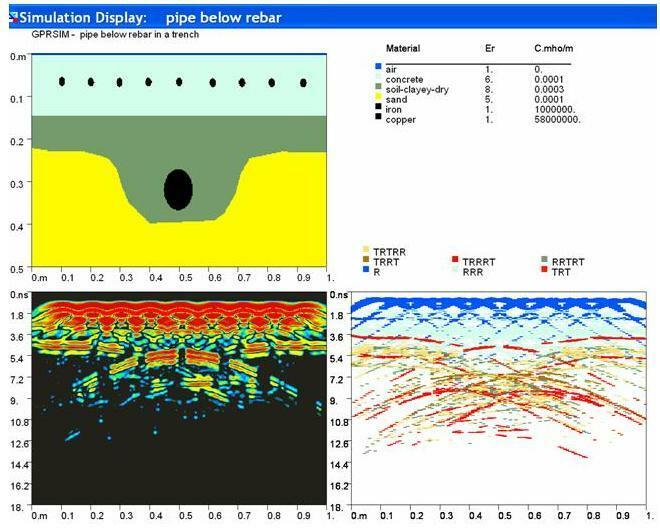 In engineering environments with many hyperbolic and regular materials, migration can be a very useful filter process to better predict subsurface structures. 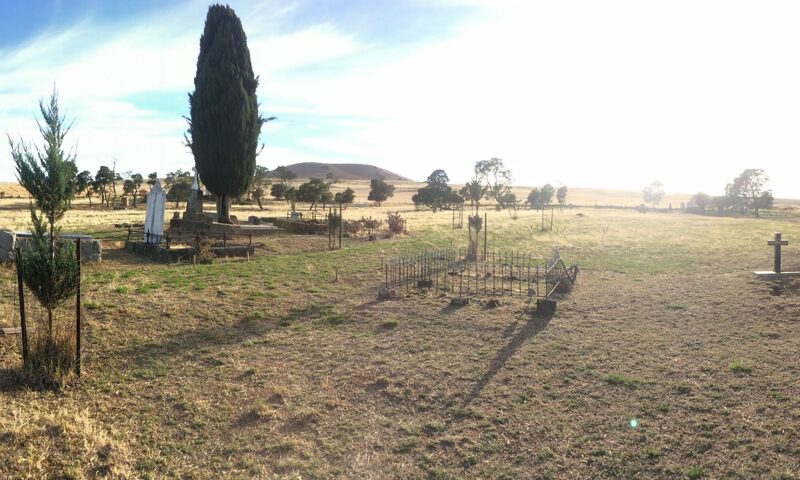 In archaeological sites where ground materials are fairly heterogeneous, migration has less applicability, but still remains an option as another form of data processing. 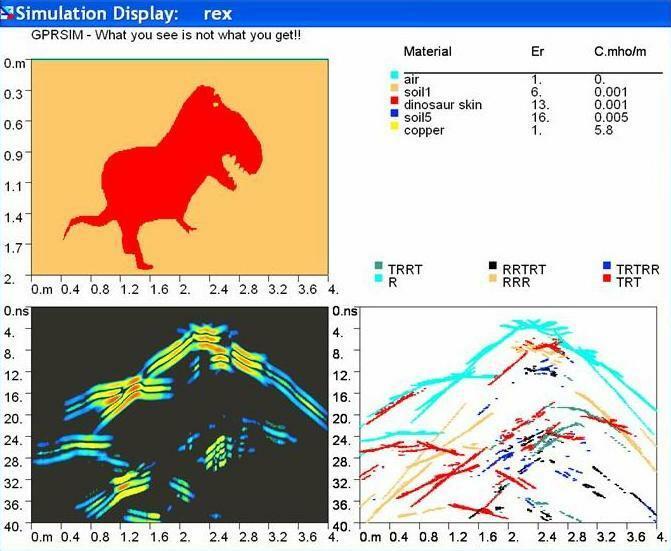 GPRSIM processing options are used to visually instruct students on GPR migration and to see the results generated real time. 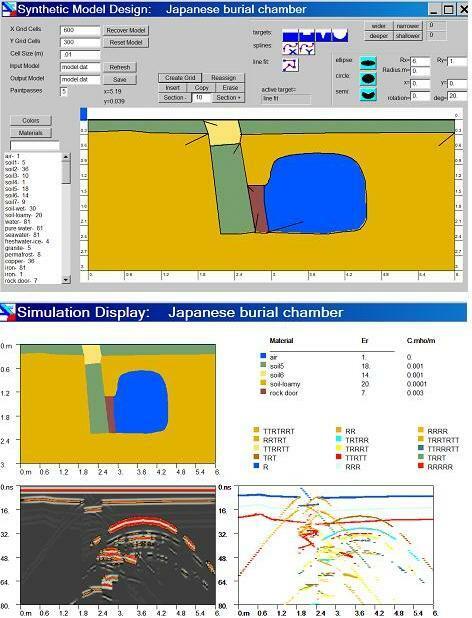 It is also possible to create simulated radargrams collected on tunnel walls or on the outer and inner surfaces of round tanks. The software effectively accounts for the antenna tilt and will compensate by rotating/tilting the beam in topographic simulations.